Ethel Zoe Bailey always served as her father’:s co-worker, accompanying him on numerous collecting expeditions. She played a substantial role in the production of the Standard Cyclopedia of Horticulture and the Manual of Cultivated Plants. 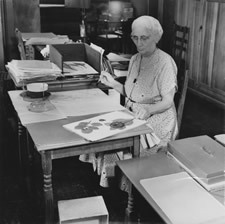 She coauthored Hortus, edited the first eight volumes of Gentes Herbarum, and served as curator of the Hortorium from its inception in 1935 until her retirement in 1957. Subsequently, she voluntarily continued her monumental index to the world’s cultivated plants almost until her death in 1983.